Prepare and bake cornbread mix according to directions on the package. 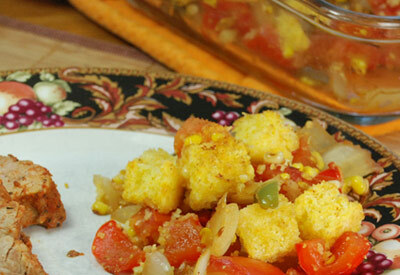 When cool, cut half of the cooked cornbread into 1- inch cubes to equal about 2 cups. In medium pan, saute fresh corn kernels, peppers and onion in olive oil until slightly tender. Add garlic and tomatoes and saute another two minutes. Spray an 8 x 8- inch pan with nonstick cooking spray and add the sauteed vegetables. Top with cubed cornbread. Sprinkle top with cumin and chili powder. Bake at 350 degrees F for 15 minutes until hot. Remove from oven and drizzle with honey. Serve the remaining cornbread with butter and honey. Stir 1/8 cup minced jalapeno pepper into the cornnbread batter before baking.